In 1804 Joseph Lyon, of Elizabethport, leased the ferry and moved the landing and stairs about midway between Grand and York streets, the slip opening diagonally up the river. There were two row-boats with two oarsmen each and extra oars for the passengers to use if they were in haste to cross, and two periaugers. In 1805 the Associates built a new tavern of brick, known as the Hudson House. It is still standing on Grand near Hudson street, and is part of the Colgate Soap works. Between this hotel and the ferry landing was a semi-circular plot around which the stages would run to unload their passengers. In the center of this plot was a willow tree which was sometimes used as a whipping post. Winfield tells that as late as 1814 a white-headed old man here received thirty-two lashes. The newspapers of the day advertised over twenty daily stage lines, besides the irregular stages, communicating with all parts of the state, and farmers wagons, even from Pennsylvania, brought produce to New York by way of this ferry. Horses and wagons were lifted on to the sail boats, but the ferriage was so expensive that in general the produce and freight was put upon the boats and the teams and wagons left in the stables of the Hudson House. The ferry site has been frequently changed. Its second removal was to the foot of York street. On April 1st, 1839, it was changed to the corner of Montgomery and Hudson streets. In 1856 the block east of Hudson street was filled in and the landing was changed to its present location. "I crossed the North river yesterday in the steamboat with my family in my carriage, without alighting therefrom, in fourteen minutes, with an immense crowd of passengers. I cannot express to you how much the public mind appeared to be gratified at finding so large and so safe a machine going so well. On both shores were thousands of people viewing this pleasing object. There was a grand entertainment to celebrate the occasion given at Lyons Tavern, to the Mayor and Common Council of New York and others. She is built of two boats, each ten feet beam, 80 feet long and five feet deep in the hold; which boats are distant from each other ten feet, confined by strong transverse beam knees and diagonal traces, forming a deck thirty feet wide and eighty feet long. The propelling water wheel is placed between the boats to prevent it from injury from ice and shocks on entering or approaching the dock. The whole of the machinery being placed between the two boats leaves ten feet on the deck of each boat for carriages, horses and cattle, etc. ; the other having neat benches and covered with an awning, is for passengers, and there is also a passage and stairway to a neat cabin, which is fifty feet long and five feet clear from the floor to the beams, furnished with benches and provided with a stove in the winter. Although the two boats and space between them give thirty feet beam, yet they present sharp bows to the water and have only the resistance in the water of one boat of twenty feet beam. Both ends being alike and each having a rudder she never puts about. The dock is one hundred and eighty feet long and seventy feet wide, the bridge is fastened to the middle of the bulkhead. `The boat being only thirty feet wide and the dock seventy, leaves twenty feet vacant on each of her sides; in each of these twenty feet spans and in the water are floating stages, made of pine logs, which lie favorably to the boat for thirty feet, and these run diagonally to the extreme end of the wharves, so that the boat when coming in hits within the seventy feet and the stages guide her direct to the bridge. 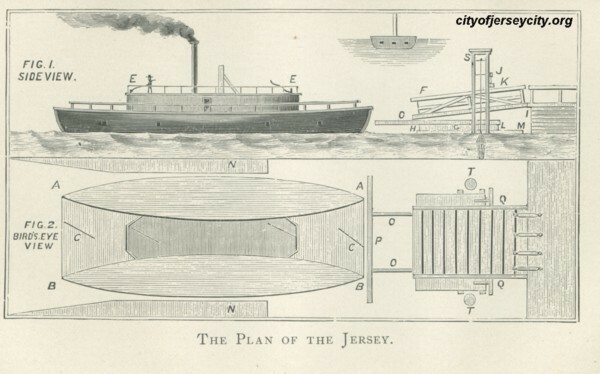 In 1813 the York, built on the model of the Jersey, was completed and placed on the ferry. It is said that "they ordinarily took an hour and a half to make a trip." They started at sunrise from each side of the river and ran all day, every half hour, by "St. Paul's Church lock." The fares were collected on the boat during the passage over. The Jersey was in service for many years and finally being condemned, was broken up and sold to Mr. Isaac Edge, who built a stable from its planks and beams. From a portion of this wood two canes were made, which are still treasured in the Edge family. The Ferry Company had a very unfortunate experience; they sank all of their capital and in 1824 were obliged to assign their lease to Francis B. Ogden, Cadawalder D. Colden, and Samuel Swartout, who secured a new lease for fifteen years and six months from November 1st, 1825. They were to provide two good steamboats, but were afterwards permitted to use a team-boat in place of one. They were also to provide rowboats. They bought and placed on the ferry the Washington. Within a year Messrs. Ogden and Swartout transferred their interest to Mr. Colden; he failed to make it remunerative and surrendered the lease to the owners, "the Associates of the Jersey Company." January 1st, 1831, they leased it to the New Jersey Railroad and Transportation Company. By renewals the lease was continued until 1853, when the Railroad bought up the stock of the Associates and became the owners of the ferry. The first night boat was put on in June, 1835. The line to the foot of Desbrosses street was started in 1862. These ferries were transferred to the Pennsylvania Railroad Company in 1871. Among the various schemes to secure patronage for the ferry by bringing people from New York, was the erection in 1825 of a large amphitheatre on the south side of Sussex street, between Hudson and Green streets, on land leased from Mr. Drayton, Sr. For about two months large numbers, mostly from New York, gathered here on Fridays to witness the fighting of bulls, bears, buffaloes and dogs.